HUL, ITC, Nestle, Colgate, Dabur, Britannia, Asian Paints, P&G are trading at nearly 48 times. The previous record high was 53 times at the end of March 1994. As investors rush to grab a piece of India's consumer demand story, they have pushed the valuation of fast-moving consumer goods companies to the highest in nearly three decades. 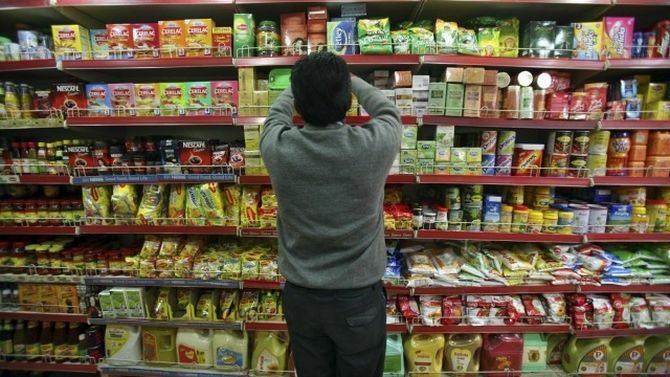 India's top consumer goods makers such as Hindustan Unilever, ITC, Nestle, Colgate-Palmolive, Dabur, Britannia, Asian Paints and P&G Hygiene are trading at nearly 48 times their earnings (or net profits) in latest trailing 12-months, up from 41.2 times at the end of March. The previous record high was 53 times at the end of March 1994 during the stock rally post 1991 economic reforms. As a result, the valuation premium that FMCG stock enjoys over the broader market is at a two-decade high. A typical FMCG stock is 110 per cent more expensive than an index (Sensex) stock, the valuation premium last seen in the run-up to the year 2000 dot-com bubble. The valuation premium, however, fell sharply post the market correction in early 2000 (please see chart). The 16 consumer companies in Business Standard sample have a combined market capitalisation of Rs 13.1 trillion, more than double their combined market cap of Rs 6.4 trillion at the end of March 2014. In the same period, companies' net profit is up 39.4 per cent while their combined net sales are up 18.3 per cent during the period. Excluding ITC, the sector's price to earnings multiple shoots up to all-time high of 59.7x. At trailing P/E of 32.2x, ITC is currently one of the cheapest large-cap consumer stocks in the country. For example, biscuit maker Britannia is the most expensive large-cap consumer stock with price to earnings multiple of 76.3x at its current stock price. It is followed by Nestle (74x), Hindustan Unilever (65.5x) and Asian Paints (61.7x). The multinational Gillette India is, however, the most richly valued stock in the sector with trailing P/E multiple of 94x. Analysts attribute the sector's rich valuation to a combination of strong fund inflows on Dalal Street and a relative lack of opportunity for investors. "The pool of investment-worthy companies continues to shrink as one sector got into trouble either due to domestic or external factors -- corporate banks, power, capital goods, construction, telecom and pharma among others," says G Chokkalingam, founder & MD Equinomics Research & Advisory Services. "As a result, most of the investors are chasing a handful companies in consumer sector that are still able to show some earnings growth. This could continue in the short run even though valuations now look stretched ruling out incremental gains for new investors," he adds. Others, however, caution against the current rally in FMCG space due to the growing mismatch between the sector's valuation ratios and the underlying growth in the earnings. 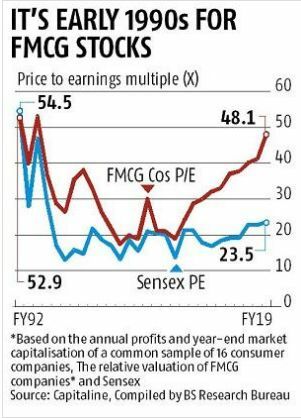 "Last time when the sector was as hot as it is now, FMCG companies' earnings were growing at 30 per cent translating into price to earnings growth (PEG) ratio of 1.5x. Earnings are now growing at 10 to 12 per cent, which means PEG ratio four looks frothy," says Dhananjay Sinha, head research, Emkay Global Financial Services. In the last three years (FY15-18), the sample companies combined net profit grew at a compounded annual rate (CAGR) of 8.6 per cent against 18.2 per cent CAGR growth in their market capitalisation during the period. In comparison, companies' combined earnings expanded at a CAGR of 25.8 per cent during FY92 to FY95 period against 11.5 per cent annualised rise in their market capitalisation during the period. Besides, the previous rally in FMCG was accompanied by a rally in the broader market unlike now when the sector looks a lone warrior. There was only a small gap between the valuation of benchmark BSE Sensex and that of consumer companies in early 1990s. For example, the index was trading at 47x the underlying earnings per share in 1994 against FMCG Company's average P/E ratio of 53x. Now, the gap in is more than 100 per cent in the favour of the latter.